We’re back again with a look at trade candidates, fantasy football players you might want to add based on possible production heading into Week 11 of the NFL season. With those in mind, here are my FLEA market finds for Week 11. Ravens head coach John Harbaugh isn’t making it easy on fantasy owners, labeling Joe Flacco a game-time decision with his hip injury and suggesting that Jackson isn’t a lock to play over Robert Griffin if Flacco can’t play. Regardless of the uncertainty, fantasy owners should acquire Jackson, because his potential is enormous. Obviously, the key to Jackson’s likely fantasy success is his legs. He took more than 200 carries per season at Louisville, which is in line with what the No. 1 rushing NFL quarterback, Cam Newton, did in his season at Auburn. However, Jackson should also benefit from an extremely favorable short-term passing schedule. The Ravens have back-to-back home games coming out of last week’s bye, and all five of their next five opponents promote passing yards per attempt and passing touchdowns per attempt relative to an average team. The Raiders (45% touchdown boost) and Buccaneers (20% touchdown boost) are particularly passer-friendly in that upcoming schedule. It’s a schedule so good for quarterbacks that I’d be tempted to start whichever of the three Ravens plays in the upcoming weeks in moderate and deep formats. With four talented skill-position players who took pretty much all of the team’s touches, the Rams were one of the easiest teams to figure out for fantasy purposes. But now that Cooper Kupp tore his ACL and will miss the rest of the season, there may be room for one more fantasy asset. I think there are two clear candidates in Reynolds and Everett. 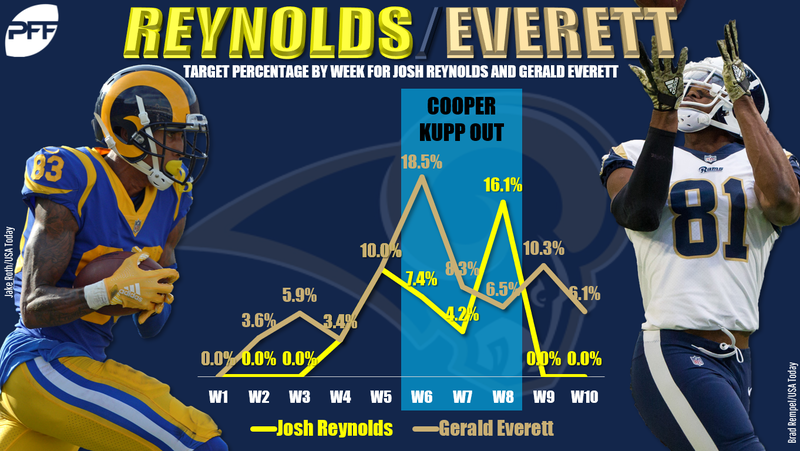 When Kupp missed a few weeks midseason with his initial knee injury, Reynolds and Everett saw their target shares spike to around 10% each. That isn’t enough of a workload to create fantasy value in shallow formats, but I still think it makes sense to pick them both up when possible in case one draws favorable treatment over the rest of the season. Since both players have shown similar slightly below-average efficiency, I don’t have a strong opinion on which is the better fantasy buy. I advocate targeting whichever fills the bigger positional need on your roster. Over the last month, the Dolphins went from having the sneaky-best group of receivers in football to barely enough to fill their starting lineup. Albert Wilson was the first man down thanks to a hip injury, and now both Jakeem Grant and DeVante Parker should miss several weeks with respective leg and shoulder injuries. With Kenny Stills playing through a groin injury that has limited him to just three catches and 45 yards the last two weeks, Amendola will likely become the focal point of the team’s passing attack when the Dolphins return from their Week 11 bye. Really, Amendola had already become a featured target. Since Week 6, his 25.6% target share has been the 16th-most in football ahead of prominent fantasy receivers like Alshon Jeffery, Robert Woods, and Emmanuel Sanders. He should be a tremendous option particularly in PPR formats leading into the fantasy playoffs, and he’s even available in more than 50% of ESPN and Yahoo leagues. You may be able to snag him without giving up an asset. Early indications are that Martavis Bryant tore his PCL and not his ACL, which is relatively good news given its 2-3 month typical rehab time rather than the 8-12 months an ACL tear requires. That’s still likely a season-ender this deep into November, and with the Amari Cooper-less Raiders lacking established options at receiver, they may turn to seventh-round rookie Ateman. Jon Gruden on WR Marcell Ateman: “He’ll be another rookie that we call on.” Seventh-round pick appears likely to make NFL debut Sunday vs. Cardinals. Even before his late draft selection, I didn’t love Ateman as a prospect because his slow 40-yard dash time suggested he would struggle to separate on deep balls like he did at Oklahoma State where he averaged 16.9 yards per reception. However, Ateman is big at 6-4 and 216 pounds, and so his potential as a red-zone threat on a team in need of bodies makes him a worthwhile stash in deeper and dynasty formats. Speaking of the former Raiders receiver, Cooper has clearly established himself as the top Cowboys receiver in his two games with his new team. However, I still think he is undervalued on the market. Cooper has had an uneven season with total numbers depressed by a foot injury, a concussion, and Oakland’s offensive issues, but his efficiency has returned to the peak form he showed in 2016. In that best season, Cooper was a top-15 fantasy option at his position, and now that he’s drawing 9 targets per game on the Cowboys, I think it’s appropriate to project Cooper to be in the top 15 at the position over the rest of this season. See if you can still trade for Cooper at a value from owners who still feel the baggage from his underwhelming first half. The ankle injury that forced normal starter Chad Williams to miss Week 10 figured to open the door for outside receivers like J.J. Nelson and Trent Sherfield. In truth, no one much benefited, with only 123 yards of passing offense excluding the 85 yards David Johnson picked up catching balls out of the backfield. Kirk turned in an especially meager total of two catches for eight yards, but I still view him as a candidate to buy because he was the quiet beneficiary of Williams’ absence. 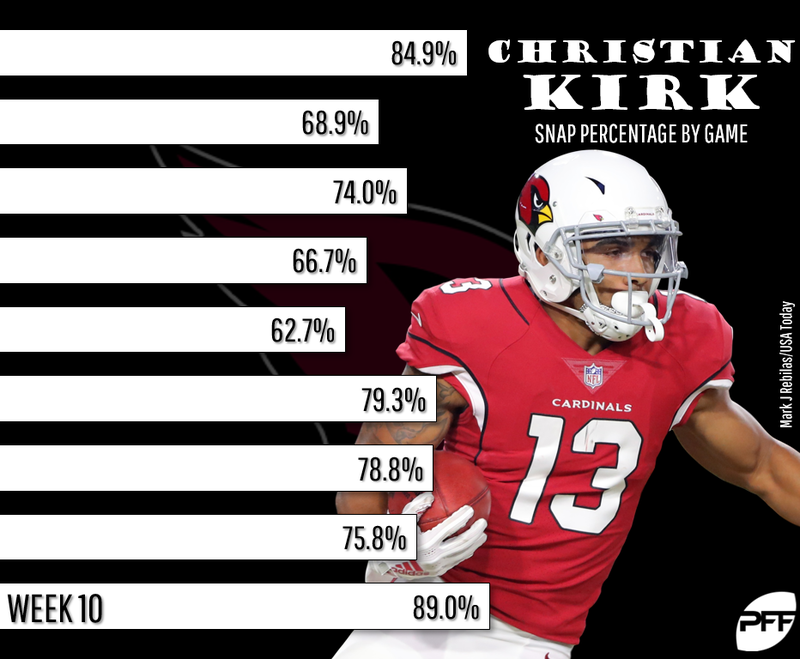 After playing between 75 and 80% of the team’s snaps in their previous three games, Kirk jumped to a season-best 89% on Sunday. Kirk has seen at least six targets in four straight games, and that total is likely to increase going forward, whatever Williams’ availability for Week 11 and beyond. That’s because Kirk has established himself as the most efficient wide receiver on the Cardinals, and it’s not particularly close. Kirk as added 14 yards on the season, 23 yards more than Larry Fitzgerald in second place. Williams has cost the team 27 yards on just 20 catchable targets, making him one of the least efficient receivers in football. Kirk remains at best the second option of a team led by a rookie quarterback, so your mileage will vary on his fantasy utility. That said, I’d definitely consider streaming him in daily or deeper formats in his attractive upcoming matchups against Oakland, Green Bay, Detroit, and Atlanta.